SharePoint needs no more marketing given it is one of the most popular enterprise content management systems. According to Redmond Magazine: "SharePoint and OneDrive are used by more than 75,000 customers, with more than 160 million users.". I am not a SharePoint MVP but as far as I can see, it comes in two flavors i.e., SharePoint on-premises and SharePoint online. Organizations prefer to use the on-premises model given it is in general only accessible over the intranet or internal network. One common use-case that I have seen or experienced in the organization is: There are many teams working in an organization for a day-to-day job e.g., HR, Marketing, Application, Legal and/or Security team etc. In SharePoint, one can have a dedicated site or page for a respective team where they can share relevant stuff (e.g., documents, news etc.) among team members and at the same time sharing outside the team is also possible. SharePoint provides fine-grained permission levels and role-based access control. The URL has two GET parameters i.e., FollowSite=1 and SiteName=<AnySiteNameGoesHere>. The FollowSite GET parameter holds a Boolean value of 0 or 1. 0 for not following and 1 for following. It is a sort of flag. The GET parameter SiteName is of our interest. It is reflected back as a part of script context like the following (watch out for the keyword ReflectionHere). In real life, this would be the name of site you want to follow. Google dorking (inurl:SitePages/Home.aspx?) for SharePoint Home Page shows 19,000+ results. The SharePoint site's home page has a general format like http(s)://<Any SharePoint URL>/SitePages/Home.aspx. Some notable and vulnerable examples I was able to identify quickly from Google Dorks are given below. If you have a SharePoint site and you can see "Follow" feature on the page, than there is a great chance that you are vulnerable. Please keep in mind that following examples (Govt. sites, agencies, universities and colleges) does not include on-premises SharePoint installations. Bounty Qualifying Email from secure@microsoft.com on 9th March 2017. 10th March 2017, email from bounty@microsoft.com regarding the bounty amount which was $2500. On 9th June 2017, I received an email regarding fix and patch will be released as a part of June 2017 updates. Here is the link to CVE-2017-8514: https://portal.msrc.microsoft.com/en-us/security-guidance/advisory/CVE-2017-8514. 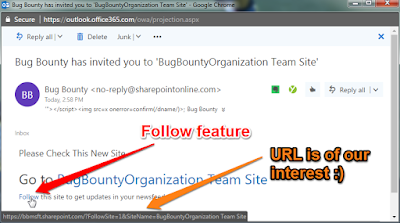 Microsoft has also released a fix for a stored XSS I found in SharePoint Project Web App. CVE-2017-8551 https://portal.msrc.microsoft.com/en-us/security-guidance/advisory/CVE-2017-8551 is related to that. I will try to do a write-up on that later. I think, it's time to go and patch your SharePoint.